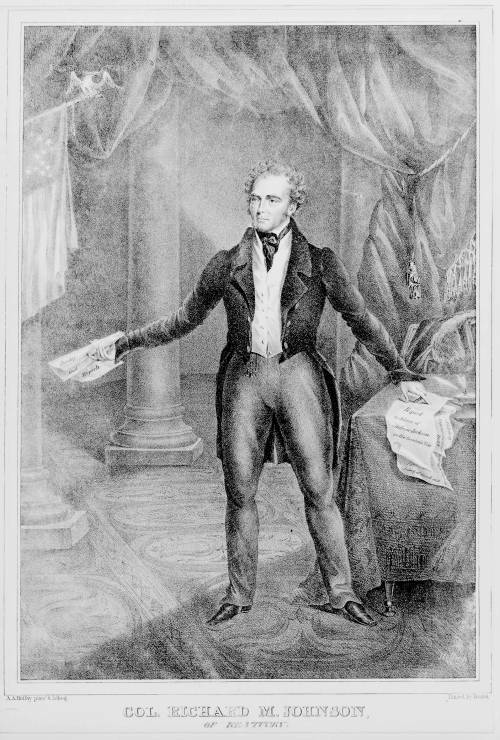 Portrait of Representative from Kentucky Richard M. Johnson, standing in a rhetorical pose and holding documents "Sunday Mail Reports" in his right hand. These refer to his important 1829 and 1830 reports, as Senate postal committee chairman, rejecting widespread petitions to abolish Sunday mail delivery. The proposal was perceived by many as threatening encroachment of church upon the powers of the state. Johnson points with his left hand to documents on a table, which represent his other legislative accomplishments. These include his "Report in Defence of Andrew Jackson on the Seminole War" (Johnson's House committee on Military Affairs minority report of 1819), "Abolishing Imprisonment for Debt" (Johnson tirelessly advocated in Congress a bill to do so for ten years, a bill which finally became law in in 1832), and "Liberty of Speech and Freedom of the Press." Behind the table is a chair on which rests a fur-collared cloak. Johnson stands in the House of Representatives chamber in the Capitol. In the background three pillars of a colonnade and curtains are visible, and on the left an American flag on a staff surmounted by an eagle with a streamer reading "The Union Must Be Preserved." This is the earlier of two versions of the print produced by Hoffay and issued by William Emmons in the Fall of 1833. (See also no. 1833-3.) This impression was deposited for copyright on September 18, 1833. The second version, deposited on October 17, was entirely re-drawn and is slightly larger. Notable differences in the second version are the inclusion of two couches or settees between the pillars and a somewhat larger eagle on the flag staff. The two prints were part of a large movement afoot in 1833 to name Johnson the Democratic candidate for the Presidency. (Johnson eventually became Martin Van Buren's vice-presidential running-mate in 1836). They were published by William Emmons, a close friend and also the author of an 1833 campaign biography of Johnson. Also copyrighted by Emmons in September 1833 was a lithograph by Edward W. Clay of the Battle of the Thames, illustrating Johnson's famous defeat and murder of the powerful Indian leader Tecumseh, and bearing a dedication to Andrew Jackson. (An impression of this lithograph is also in the Library's collection.) In the earlier version of the portrait and in the battle print Emmons's name in the copyright line is inscribed in pen and ink rather than printed.